I have a sweet tooth. No question. I am always game for almost any baked good or dessert, especially if there’s chocolate involved. Just take one look at my Pinterest “Sweets Recipes” board or “Cookies Recipes” board and it’s obvious that I would have serious problems if I actually made all those recipes. Because it’s clear I’d be forced to at least sample them, right? Well, truth be told, I actually have tried many of them. For a while, every week I would let one of my children choose any recipe on my desserts or cookies board and we would make it. That was fun while it lasted. Well besides the calorie count, let’s face it, spring & summer in Michigan can have some pretty hot & humid weather, so baking isn’t always an option. No-heat required recipes can be just the thing for a hot summer day. And this recipe is an easy & healthy dessert option, so it’s a really a winning solution all around. 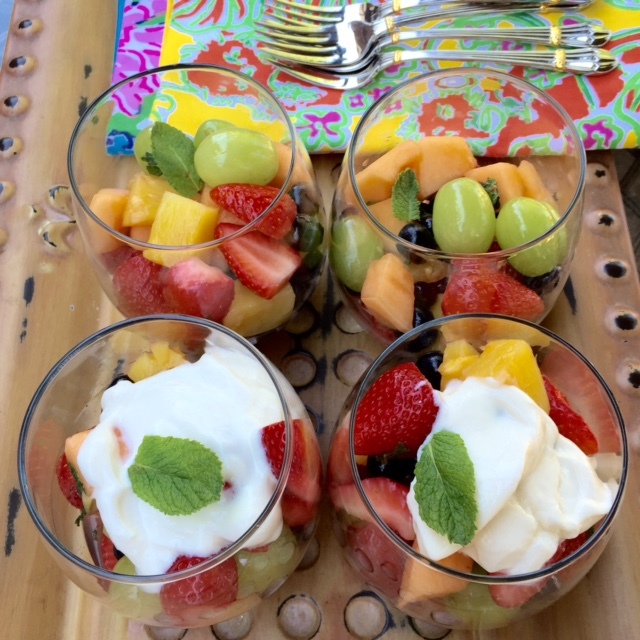 The fruit is the star of the show and needs just a few things to brighten things up and tie it all together into an awesome boozy fruit salad. Note: Feel free to substitute your favorite fruit to total ~10-12 cups all together. Whisk first six ingredients in a small bowl. Set aside. 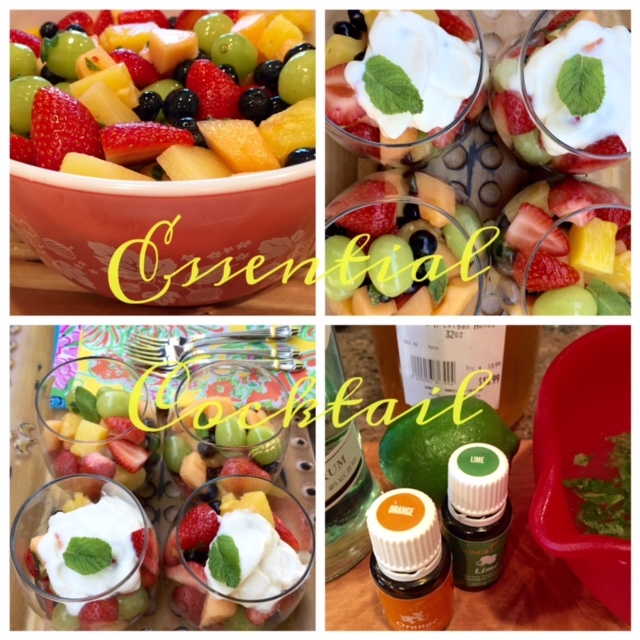 Wash and cut fruit and put in a large mixing bowl. Pour reserved liquid glaze over the fruit and stir to coat the fruit. 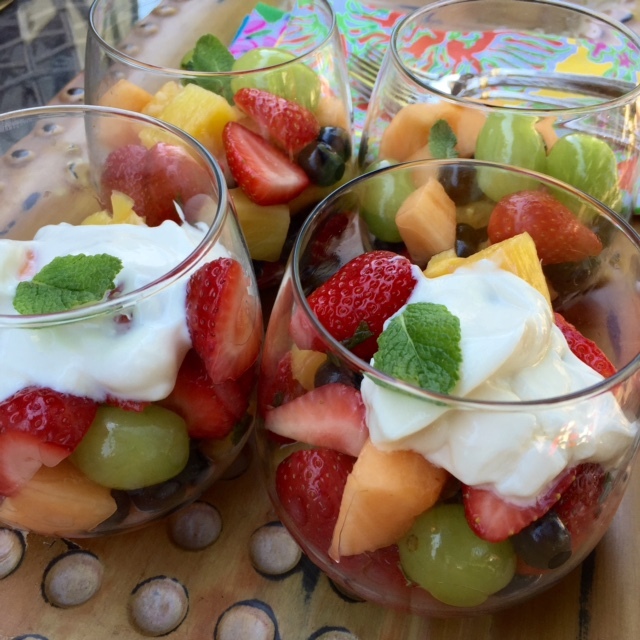 Serve in individual bowls with optional toppings: greek yogurt, slivered almonds, and/or granola. Garnish with mint leaves. 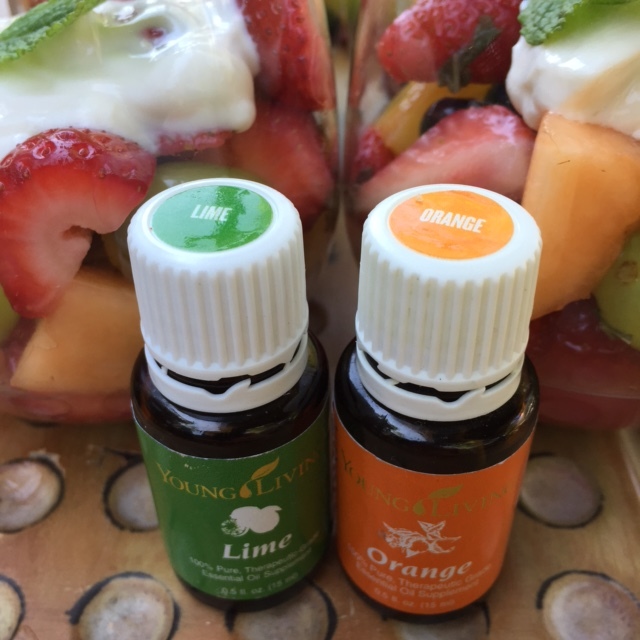 Young Living orange and lime essential oil are both cold pressed from the fruit rind and high in the natural occuring constituent d-limonene. Some people may find citrus juice, especially in high amounts to be acidic on their stomach, yet citrus oils are different and may be a good alternative. Be careful to read the label directions for dosage; EO’s are highly concentrated.